NASHVILLE — Biscuits are the original fast food. A convenience food back when there were no convenience foods, they’re best when made quickly. In fact, taking too much care and time with biscuit dough will leave biscuits flat and dry. The reason your grandmother made such terrific biscuits is that she simply didn’t have time to think about them; she just threw the ingredients into a bowl, mixed them as quickly as possible, and shoved them into the oven. The result of such neglect was the fluffy, moist, versatile and quintessentially Southern biscuit we all crave. You can stick a piece of meat in one and call it breakfast. They are the natural dinner companions of steak, chicken, ham and of course gravy. A teaspoon of jelly turns one into dessert. Leftovers — if there are any — freeze well and can be toasted on some other cold morning. The increasing interest in fresh, local foods makes cooking—with all the time that involves-- necessary. When there are several pots on the stove to be tended and other ingredients actively sautéing in a pan, knowing how to throw together a pan of biscuits can be a real help. They’re also a worthy target for a number of local ingredients, from the milk and butter for dough to the honey, sorghum, country ham or eggs that inevitably land between the buttery tops and crunchy bottoms. A collection of biscuit recipes ranging from traditional to trendy are featured now at the Pick Tennessee Products website, www.picktnproducts.org. Tammy Algood, Pick Tennessee Products spokesperson and author of The Complete Southern Cookbook, creates seasonal recipes featuring products grown and processed in Tennessee. Pick Tennessee Products is the statewide campaign developed by the Tennessee Department of Agriculture to help consumers find Tennessee farms, farm products and foods processed in Tennessee. More than 1,600 farmers and about 7,000 products, services and events are currently listed at the site. This year, can that can of pre-made dough and resolve to make real biscuits the old-fashioned way —without thinking about it. Visit www.picktnproducts.org for more seasonal recipes and to find farm-direct and other locally grown and processed foods. Preheat the oven to 450°F. 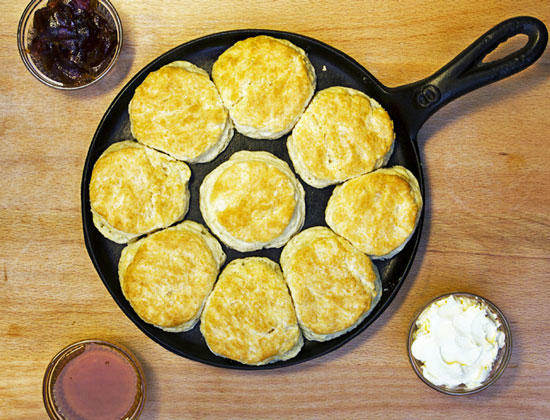 Lightly grease a cast iron biscuit baker or baking pan and set aside. Place the flour, baking powder, baking soda, and salt in a mixing bowl. Cut in the shortening with a pastry blender or fork until the mixture resembles coarse meal. Add the buttermilk and stir until a soft dough is formed, about 25 strokes. Transfer the dough to a lightly floured surface and knead until smooth, about 10 times. Roll to 1/2-inch thickness. Cut with a 2-inch cutter and transfer to the prepared pan. Bake 13 to 15 minutes or until golden brown. Serve hot.